I use lot Google for search and this script help a lot to remove "fake results". A new kind of fake results begin to appear more and more since a few weeks, spammer use fusiontables to spam results with junk links. I really like to have an option like a toggle button to remove those spammy fake results. It will save lot of time when we search. The script currently only looks at the host name and not the rest of the URL. It would really be a significant rewrite to add that. 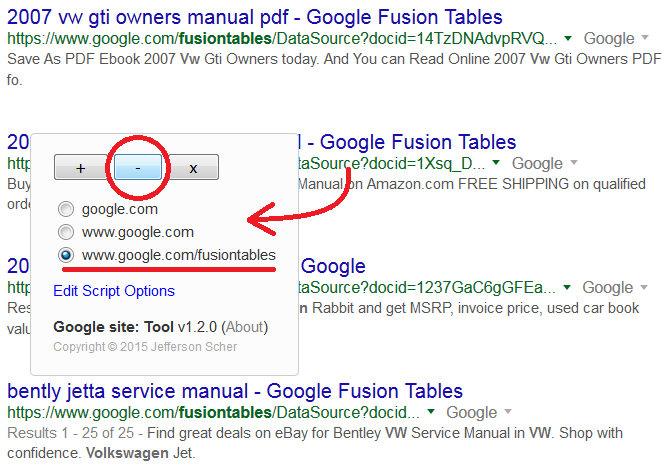 Perhaps it would help to use another of my scripts, Google site: Tool to exclude fusiontables URLs from a query when you run across them. The attached screenshot illustrates its operation: click the green "cite" line, then select the most specific URL, then click the minus button. The script updates the query and reloads the page. Thanks I will try it ! Funny you should mention Google Site:. I got pretty obsessed with that script for a while, until I found this one. Google often kicked me off because my query was so complex and I kept tweaking it. Google is really getting rediculous with these spam hits. If it weren't for you, Jefferson, we'd have no decent search engine left to turn to.